The death last month of the former senior British police officer, John Stalker, will no doubt have rekindled many disturbing and distressful memories for the families of six men shot dead by the Royal Ulster Constabulary (RUC) during the dark weeks between 11th November and 12th December of 1982. Six men – Eugene Toman, Sean Burns, Gervais McKerr, Michael Tighe, Seamus Grew and Roddy Carroll – were coldly executed in three separate pre-planned ambushes by the RUC. Evidence which emerged during a number of court-cases, including autopsy and independent forensic reports, subsequently repudiated the official RUC and British state versions of the six murders. Five of those killed in two of the shoot-to-kill incidents in Lurgan and Armagh City had been unarmed. In the other case, during which seventeen-year-old Michael Tighe was shot dead in a disused hayshed, three unusable world war one-era weapons were later found. 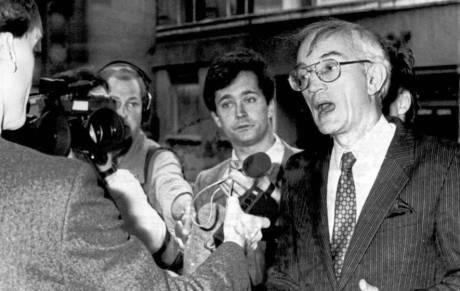 John Stalker, who was the assistant chief constable of Manchester at the time, was later asked to conduct an independent investigation into all six deaths. He commenced his inquiry in May 1984.. A crucial part of Stalker’s investigations centred around the shooting dead of Michael Tighe in a hayshed at Ballinary, in the countryside a few miles from Lurgan. Arising out of his investigations, Stalker had become aware of the existence of tape-recordings of that shooting, which had been made by Britain’s MI5. He demanded the production of those missing tapes from the RUC and MI5, as vital pieces of evidence. As has too often been the case in killings carried out by state forces, one series of injustices soon led to another. When it became clear that the publication of Stalker’s comprehensive report would expose serious and criminal wrongdoing by the crown forces, a new cover-up began at the most senior levels of the RUC and within the British government itself. Among those fearful of what Stalker would expose were the then RUC Chief Constable Jack Hermon, deputy Chief Constable Michael McAtamney, and senior Special Branch officer, Ronnie Flanagan. Flanagan would himself become RUC Chief Constable in 1996. He maintained that position through the re-branding of the RUC as the Police Service of Northern Ireland (PSNI) in 2001, before eventually stepping down the following year. Stalker became the victim of an officially sanctioned dirty tricks campaign, to discredit him and by extension the findings of his report into shoot-to-kill in occupied Ireland. In June 1986, John Stalker was removed from the inquiry just before he was due to publish his report into the six murders. Stalker had concluded that the most senior ranking officers within the RUC and Britain’s MI5 played a central role in the direction, control and coordination of all the shoot-to-kill incidents. Official state papers, released in 2016, quoted Stalker as stating that what he was concerned with was not the minor question of lying or covering something up – “it was murder, six murders”. Stalker was also reported as stating “the killings had a common feature: each left a strong impression that a type of pre-planned police ambush had occurred and that someone had led these men to their deaths. The circumstances of those killings pointed to a police inclination, if not a policy, to shoot suspects dead without warning rather than to arrest them”. Neither John Stalker’s report into the county Armagh shoot-to-kill cases, nor the version produced by his replacement, Colin Sampson, have ever been published. Almost thirty-seven years on from 1982, the families of those six men shot dead by the RUC are still seeking justice. In the same week that John Stalker died, the supposedly reformed PSNI was once again publicly exposed for its failure to fully release information relating to murders by unionist death squads of nationalist civilians. Little surprise, therefore, that confidence in the nationalist community in the PSNI is now at an all-time low.